Buenaventura “Bong” Villamayor (picture from thestar). The organizer, PCA (Penang Chess Association) has decided to change the Penang Chess League to 2008 Pesta Pulau Pinang Chess Open Tournament (Pertandingan Catur Terbuka Pesta Pulau Pinang). 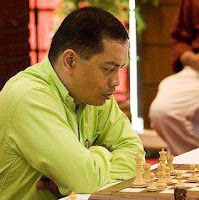 Top seed of this tournament is GM Buenaventura “Bong” Villamayor from Phillipines. He will team up with Anthony Liong Ing Kiat,Loo Swee Leong and Elgin Lee Kah Meng (Team WHH Senior). The other top player register is GM Moussa Taleb and team up with Muhd Tariq Amru, Muhyiddin Muhd Isa Mohd Azmi and Muhd Nabil Azman Hisham (MIXTRA-ZONE). My team (Horwitz Bishop-NORAZWAN, Me and HAFIZAN) with rating 1479 just join this tournament for fun and enjoyable. Because off the participant is to better than Horwitz Bishop. Perhap we will not finish at bottom of the table and lose again school boys. I think the organizer should make this tournament become national rated tournament. Most off the Malaysia active player take part this time.